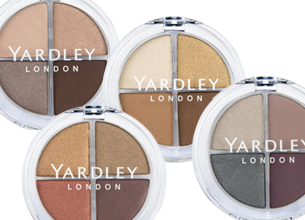 Yardley Eyeshadow Quads contain four different colours and shades to suit any occasion and are easy to blend for striking effect. I am eye shadow crazy and when I saw the Quad, I instantly fell in love. I bought the Dynasty Quad and it’s beautiful and really brings out my eyes. I have not tried these yet, but will very soon. Yardley shadows are soft and the pigment lasts. I like the colours they have put together with these.